This week's fishing on Lake Texoma hasn't changed much compared to last week. We are still catching fish in the morning on live bait fishing deep water in the 55'-70' range. When I find a school of fish, I try to stay and work them hard. Some days they bite and other days you can not buy a bite. With the cool water temperature the fish seem to be feeding really well every 3rd or 4th day, but on the other days they just will not bite. If you find a school of stripers that won't feed, it is more than likely to be the same condition anywhere on the lake you go looking. Evening fishing is still better. As of this week, the numbers of fish we have caught has gone done but the quality of fish caught is very good. My Monday afternoon trip produced fish as large as 10lb-10oz. 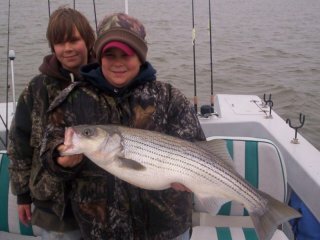 Pictured below are Brandon & Chad with a 9 lb. striper.